Paul Jacob Naftel was a self-taught artist, and he began exhibiting views of his native Guernsey in the early 1850s. 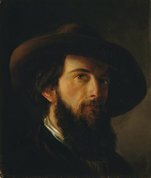 He was made a full member of the Society of Painters in Water Colours in 1859, after which time his work was increasingly recognised in London. Before dispatching finished watercolours for exhibition, he often previewed them in his purpose-built studio in St Peter Port. In 1870 he moved to London and became very successful as a private teacher. 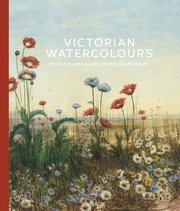 A solo exhibition comprising 66 watercolours by Naftel was held at the Fine Art Society in 1889. Naftel routinely searched out natural beauty spots during his painting trips to the Lake District, North Wales, Scotland and Ireland. A stream from the Dochart, Perthshire was one of the first watercolours to be purchased by the Art Gallery of NSW. It shows a rocky stream with light filtering through the canopy of lush vegetation, creating pockets of sunlight and shadow. It is one of a series of watercolours resulting from the artist’s visit to Perthshire in the Scottish Highlands in the early 1870s, of which several were exhibited at the Society of Painters in Water Colours between 1873 and 1875. As the result of the work’s prolonged exposure to daylight, the landscape’s prevailing vivid green tones have faded and yellowed. Nevertheless, many of the original effects can still be appreciated due to the Naftel’s extensive use of bodycolour and opaque white, a technique he used consistently.